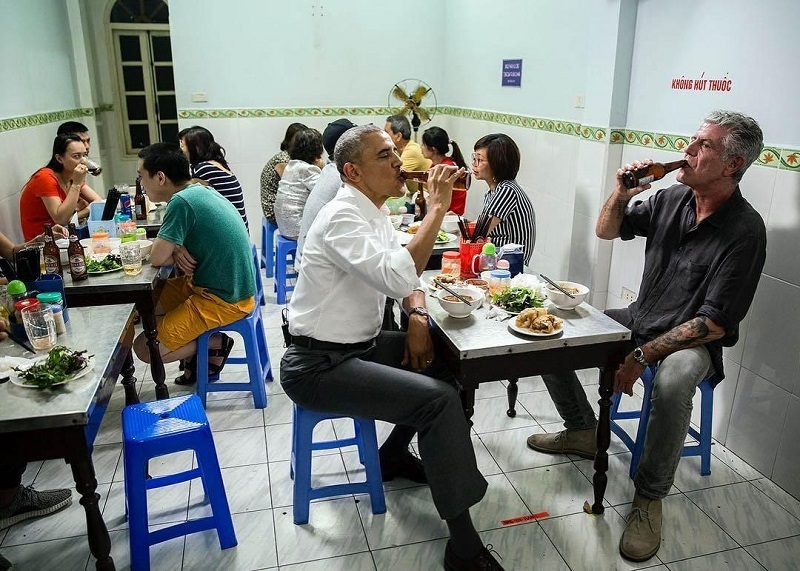 During his visit to Vietnam on May 23rd, US President Barack Obama enjoyed some Vietnamese food in Hanoi. 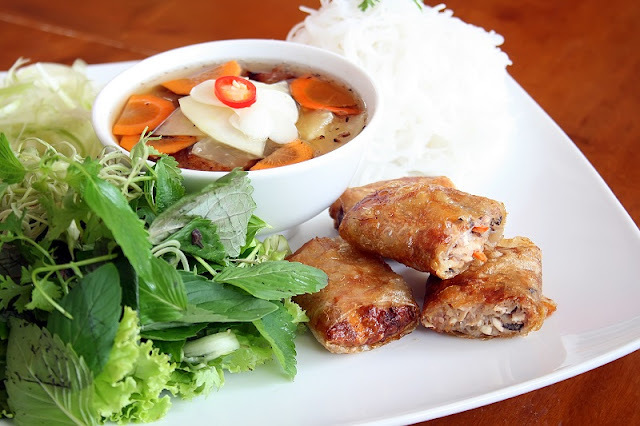 Bun Cha Huong Lien has long been known as a longstanding gastronomic address in Hanoi. The restaurant has been open for 23 years and has gone through 3 generations. The owner said that he was informed that there would be an American TV channel a few days ago, and that the afternoon of May 23, a health inspection team from the Ministry of Health arrived but the family did not know the special guest would visit is US President. After coming to the bar, after greeting everyone, Mr. Obama said he knew this is a good restaurant so he would like to come over to try it. After eating on the second floor, before leaving, he said goodbye to everyone, fingerprints that the food was great and bought 4 meals brought back. Crab and spring rolls are two specialties of the restaurant that almost guests come to the restaurant also called. Mr. Obama and the chef have ordered two drinks and two bottles of beer. On his personal page, Anthony writes, "Low chairs, cheap but very nice noodles, Hanoi cold beer." About the price, the owner said that he kept the same price as the day is 40,000 VND a rate. On Facebook personal, the chef writes: "The total cost of eating bun cha in the evening with the president is $ 6, I pay. The plus point of the restaurant is cool, large space if you follow the crowded crowd. The shop is only available from the late morning and quite crowded at lunchtime. 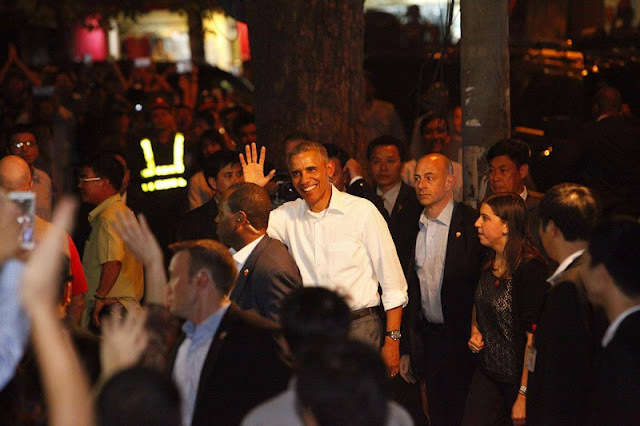 Earlier, at noon 23/5, US President Barack Obama attended the reception of Vietnam at the International Convention Center, Hanoi. The dishes served at the reception are: Nộm Xoài Cát Bề Bề Nướng, Nem Bao Cánh Én, Cuốn Ba Miền (Nem Rán, Nem Cuốn, Phở Cuốn), Càng Cua Bể Bao Rong Biển, Súp Tôm Hùm Bách Ngọc, Cua Bấy Chiên Bơ Xốt Trứng Muối, Miến Om Dùng Gà, Thăn Bò Nướng Phên Sốt Mận, Khoai Lẵng Quà - Rau Xanh Om Bơ There are also fresh fruit South, cakes, coffee and tea.